We have maintained a leadership position among OMCs in the CNG industry since inception. PSO was the first Oil Marketing Company to commission CNG facility in January 1996. There are 257 PSO CNG stations in operations throughout the country which is highest among all OMCs in Pakistan. We have maintained leadership position among OMCs in the CNG industry as well as the POL market by holding CNG market share of 22.5% in FY-13. In order to ensure the safety standards, all our CNG dispensing facilities are carefully inspected by qualified and equipped HSE specialists on regular basis. We annually arrange CNG Technical Training Seminars on countrywide basis, in order to impart knowledge pertaining to the safety and technical aspects of CNG business so that “Zero incidents” at PSO CNG stations may be ensured. 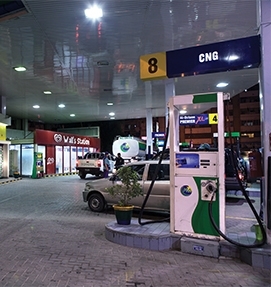 CNG is a generic product, therefore in order to attract consumers towards PSO CNG stations; we initiated brand building activities and organized CNG Customer Care Days throughout Pakistan with various promotional campaigns. This event helped us in creating brand equity for its CNG business and strengthening customer loyalty for PSO CNG stations. In order to encourage safe use of CNG in Pakistan, we have been playing a remarkable role by instigating “CNG Customer Awareness Campaign” through print a as well as electronic media (radio) and also at the forecourt all over Pakistan, wherein our team interacted with the customers and provided safety precautions to be taken during CNG refueling and installation/maintenance of CNG cylinders and kits, which is its step to create safety awareness for general public. Mobile CNG Quantity Measurement Unit is operative throughout the country to ensure that the right quantity of CNG is delivered to our valued customers.